The catalog is released in Hong Kong, please contact we[email protected] for purchase details. 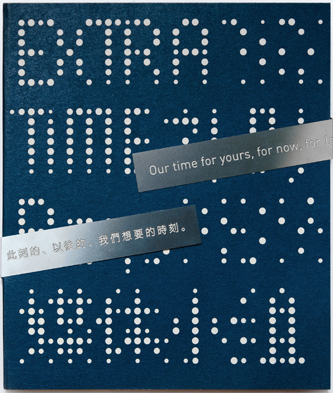 Extra Time opens as the Chronus Art Center’s inaugural show in Shanghai on 23 August. The exhibition was initiated as a West Heavens project in 2010 to invite Raqs Media Collective to create artworks specially for the Chinese audience. The show brings together new and recent works by Raqs Media Collective (New Delhi, India), focusing on their investigations of time and temporality in different registers that span the spectrum of their diverse practice ranging from performance, to installation, architectural ensembles, video and photography. For Raqs, time is more than the subject matter of their work. They treat time as if it were an actual medium, using duration, repetition, echo and the traces of our subjective responses to time’s passage as raw material for the construction of assemblages that seek to deflect the urgencies proposed by capitalism in favor of more considered ways of thinking about the world. By creating striking constellations of images, by using found and solicited material, quoting and transforming elements of news photography, ubiquitous signage, theater, architecture and broadcast sports video, Raqs points to their vision of the networked nature of artistic and cultural production in the contemporary world. The works in this show are in several instances distillations of the many ongoing conversations that Raqs maintains and cultivates across disciplines and genres with different kinds of practitioners. These are the embodiments of their dialogues with theater, with journalistic photography, with architecture, with theory and discourse. This polyphonic iteration of their thinking process is in keeping with their understanding of our sense of our time and their own practice as being composed of many different elements that need to speak and listen to one another. Extra Time may be seen as a result of this conversation, as a thoughtful analytical tool, a poetic device, a theatrical demonstration as well as a sporting entertainment that unpacks and recomposes these elements into a cogent yet whimsical set of statements and gestures about being alive to the demands of being artists in today’s world. Raqs has been in continuous conversation with West Heavens since 2010. They were invited by Place, Time, Play: India China Contemporary Art Exhibition in 2010, the first exhibition of West Heavens, and created a new performance and installation work Revolutionary Forces. They initiated an Artist Dispatch project (Delhi–Shanghai) with West Heavens in 2011, which evolved into the Shamans and Dissent exhibition in Hong Kong in 2013. 92 The Possibility of a Genealogy of the Crowd?